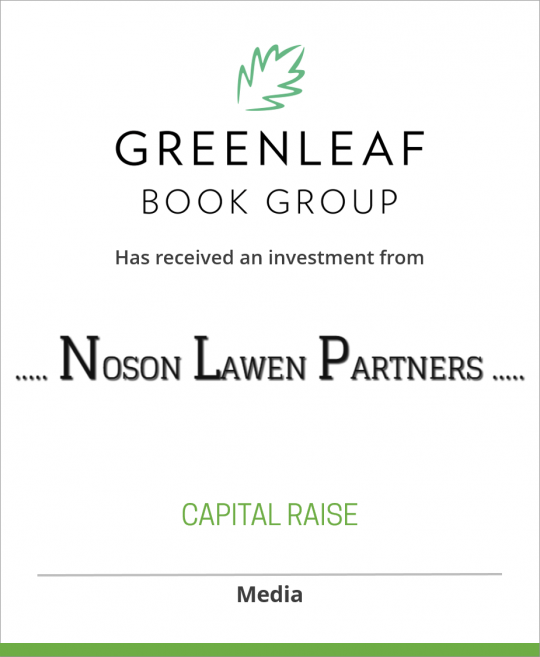 DeSilva+Phillips, Mediabankers announces that its client, Greenleaf Book Group LLC of Austin Texas, has received an investment from Noson Lawen Partners. Greenleaf Book Group (Greenleaf) is a U.S. based publisher and distributor of adult non-fiction and fiction trade books – both paper and electronic – that specializes in the development of independent authors and the growth of small presses. Greenleaf’s innovative publishing model was designed to support the independent author by making it possible for writers to retain the rights to their work and still compete with the major publishing houses by providing national distribution to both brick-and-mortar booksellers as well as online e-book marketplaces. Greenleaf has been listed on the prestigious Inc. 500|5000 list of the fastest-growing private companies in America for six consecutive years. There are six imprints under the Greenleaf Book Group umbrella – Greenleaf Book Group Press, Emerald Book Company, Live Oak Book Company, Olive Tree Book Company, Inc. 500 Press, and Legacy Book Company ¬– all of which were included in the transaction. Earl Macomber of Noson Lawen Partners noted that Mr. Greenleaf is “a dynamic and passionate CEO, and we are eager to work with him to build upon his vision for the company going forward.” Mr. Macomber added that NLP plans to further invest in and expand Greenleaf’s already substantial product suite through both internal development and acquisitions. Noson Lawen Partners is an institutional private equity firm focused on providing growth and buyout capital to smaller U.S. information and media companies. These are typically rapidly growing niche businesses with strong management teams operating successfully below the lower middle market. NLP is the third fund managed by partners Ted Carroll and Earl Macomber who have worked together daily for over 20 years and have had direct involvement as investment principals in over 75 information and media industry transaction. NLP’s limited partners include public and private pension funds, endowments, and foundations.